The Medipack offer Syrup Manufacturing plant for Liquid. with a Capacity is 250 Liter to 10,000 Liter. we are also make Filling, Capping, Labelling and other Allied Machine in this category. please so our products and send ur requirement. Outfitted with a modern infrastructure, we are the most prominent company, providing Liquid Syrup Plant. 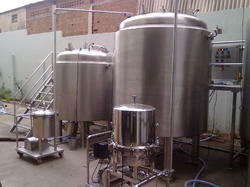 This plant is specially designed to take care of two critical factors which directly affect the quality of the liquids. Our provided syrup plant is a perfect tool for the pharmaceutical industry for the production of oral liquids. Offered machine consists of a closed circuit manufacturing facility from feeding of sugar / water phase to loading the liquid. The Sugar Syrup Vessel is supplied with high speed stirrer steam heating facility.